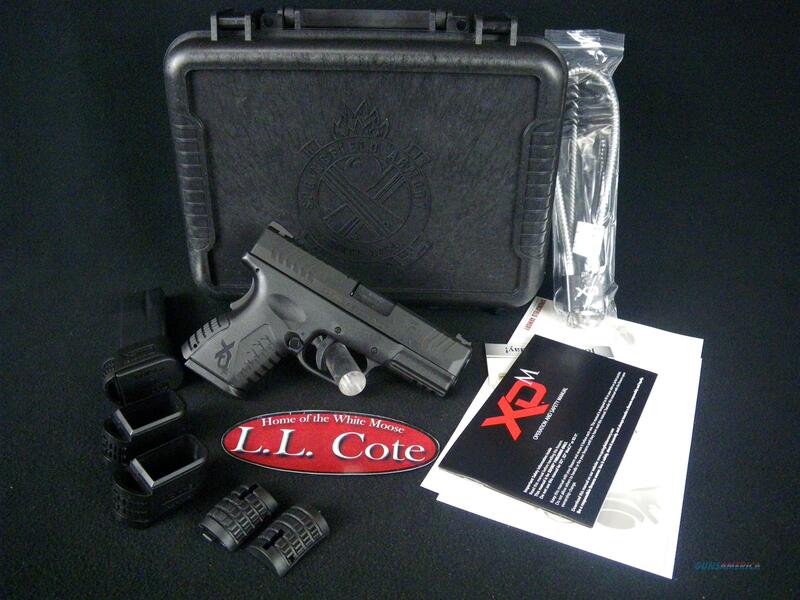 Description: You are bidding on a Springfield XD(M) Compact in 45ACP with a 3.8" barrel. If you’re looking for a versatile carry pistol that is packed with features, has amazing capacity, and performs flawlessly, look no farther than the XD(M)® 3.8” Compact. The XD(M)® 3.8” Compact is the smallest of the XD(M)® line, but it’s by no means the least. It boasts the same superior ergonomics, reliable performance, and features that make larger XD(M)®’s easy and intuitive to use in a slightly abbreviated package. And you’ll be amazed at how fun it is to shoot. The XD(M)® 3.8” Compact has a 3.8 inch barrel mated with a shortened compact frame. When combined with the versatility of XD(M) Gear® X-Tension™ (USPAT7191556) magazines, the XD(M)® 3.8” Compact is ready for daily carry or a day on the range. Put in an X-Tension™ (USPAT7191556) magazine, and you have a 19 round full-sized 9mm pistol (16 rounds in .40SW, 13 rounds in .45ACP.) Use the flush-fitting 13 round magazine, and you have a Compact (11 rounds in .40SW, 9 rounds in .45ACP.) Like all XD(M)®’s, the XD(M)® 3.8? Compact comes with three interchangeable backstraps, fiber optic front and low profile combat rear sights, mega-lock frame texturing, an ambidextrous magazine release, a multi-position frame rail, and a match grade barrel.You’ll also find all the safety features that make the XD(M)® a safe pistol in responsible hands. If you want a gun for daily carry as well as a trip to the range, but you only want to buy one gun, try the XD(M)® 3.8” Compact. You’ll be amazed at how controllable it is to shoot and how easy it is to conceal. It’s two guns in one. Displayed images are stock photos. Any questions please feel free to ask (our phone number is in the additional information tab above).